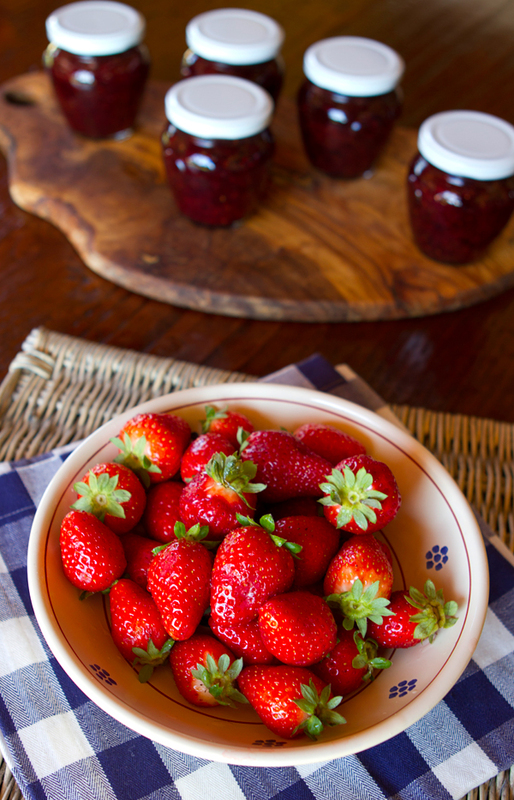 When we arrived in Umbria just over a month ago, ripe, luscious strawberries were seen in every local market and although it was on my “to do” list to make more of my Strawberry Balsamic Jam With Black Pepper , I also wanted to make a lighter jam that I could share with our farmhouse guests for breakfast. We were so busy our first three weeks in Umbria though, opening up the houses, painting, cleaning the gardens etc, that I almost missed the end of the local strawberries. Luckily, a week or so ago I found one farmer at my favorite Thursday market in Ponte San Giovanni that still had some strawberries so I bought a couple of flats and set out to make some jam. 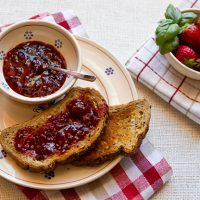 I had seen Strawberry Basil Jam all over the internet last year and decided to give it a try myself this year along with my spicier Black Pepper Jam that I love to serve with sharp cheese. The basil jam turned out really well, and although you really cannot taste the basil, the fresh herb does give the jam a little depth of flavor. Note: To test if you jam has gelled, put a saucer in the freezer before you start. When your jam has eached 220 degrees F. place a spoonful on the chilled plate, return to the freezer for 1 to 2 minutes, then check for doneness by tipping the saucer from side to side. If you want a firmer gel, cook for a few minutes longer. 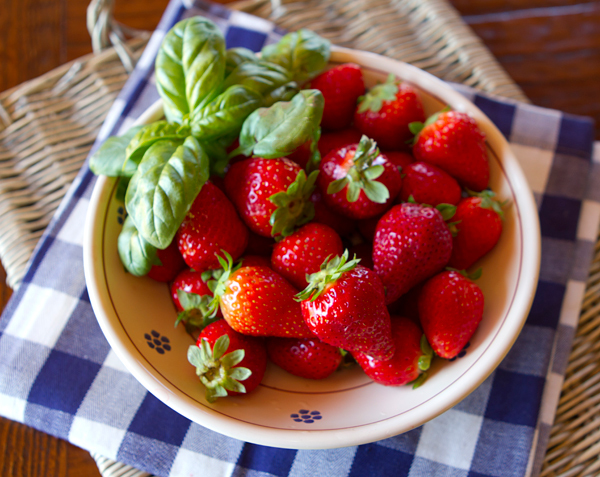 Luscious, ripe strawberries from the market and basil from our garden. 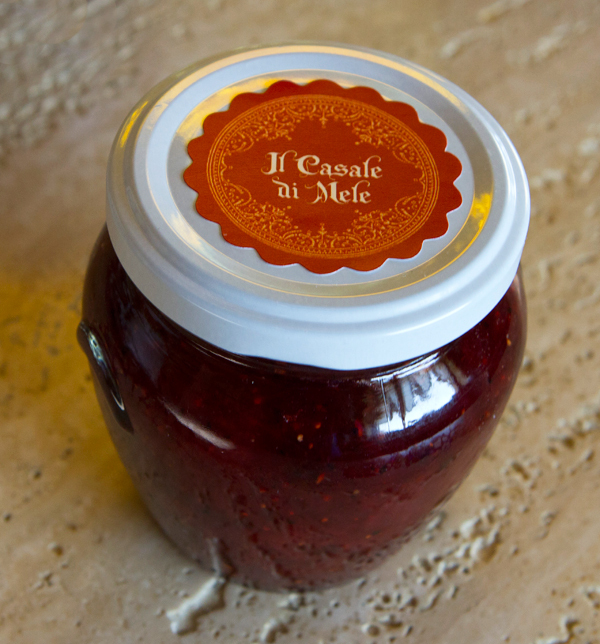 I had labels made with our farmhouse name “Il Casale di Mele” and I tie each jar with a raffia bow and add a matching tag with the name of the jam to give to our guests. A subtle, sweet flavored jam. Put the berries, lemon juice and zest, and sugar into a heavy bottomed saucepan and bring to a boil, stirring to dissolve the sugar. 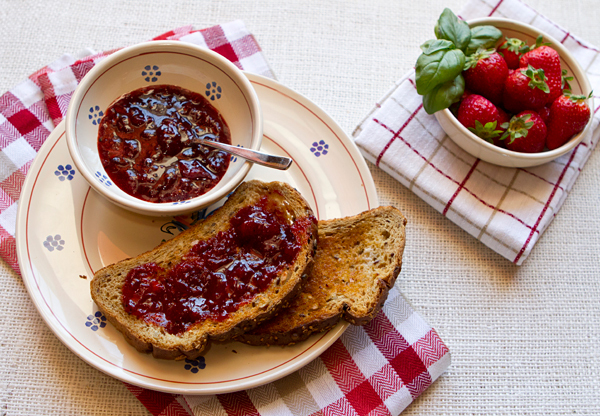 Keep heating the jam until it reaches a temperature of 220 degrees F., stirring often. Warm lids in hot (not boiling) water to sterilize and soften seal. Add the basil in the final 5 minutes of cooking. When jam has reached the desired consistency (see note above re testing), remove from heat and skim off any foam. Ladle hot jam into jars, leaving 1/4-inch of headspace. Wipe jar rims and threads and close with lids. Process in a boiling water bath for 10 minutes, then remove from water and let cool completely, 12 hours without moving. Tighten lids and store in an dark cupboard for up to 1 year.